Snaketown Side-notched point, Tonto National Monument. Click the image to open the Snaketown Side-notched gallery. Geographical Range: Southern Arizona; concentrated near the confluence of the Salt and Gila rivers. Similar points have also been found in the Upper Verde River area, the Flagstaff area, and in east-central Arizona and western New Mexico. Date Range: A.D. 1300-1450 (Sliva 1997); A.D. 1200-1400 (Justice 2002). Size: Average max length: 25.8 mm; average max width: 12.3 mm; average max thickness: 3.4 mm (Justice 2002: Appendix). 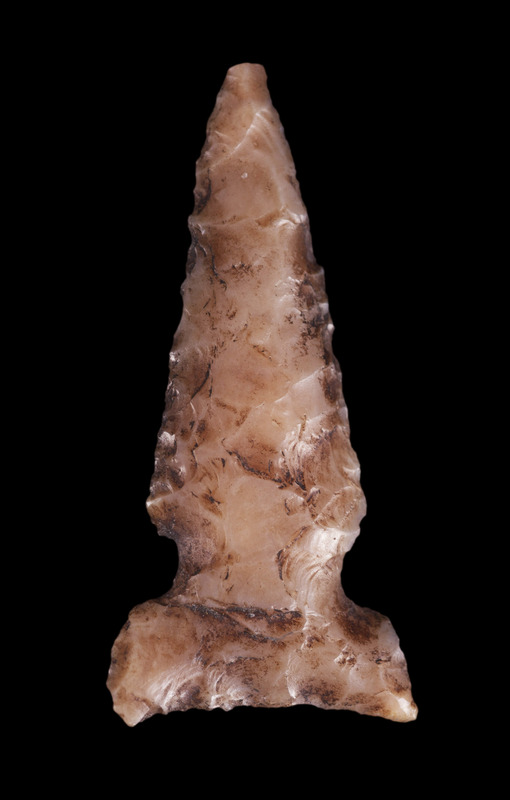 Shape: Triangular with a narrow neck and low-set wide side notches; fine serrations are common. Base: Straight to concave, with prominent squared to rounded ears; ears may have slightly incurvate ends and are generally wider than the blade. Notching: U-shaped, wide, and low-set. Materials: Chert, obsidian, and less frequently, other materials. Other Names: Late Classic Side-notched; Sauceda Side-notched; Wide Side-notched. Sliva, R. Jane. (1997) Introduction to the Study and Analysis of Flaked Stone Artifacts and Lithic Technology. Center for Desert Archaeology, Tucson.